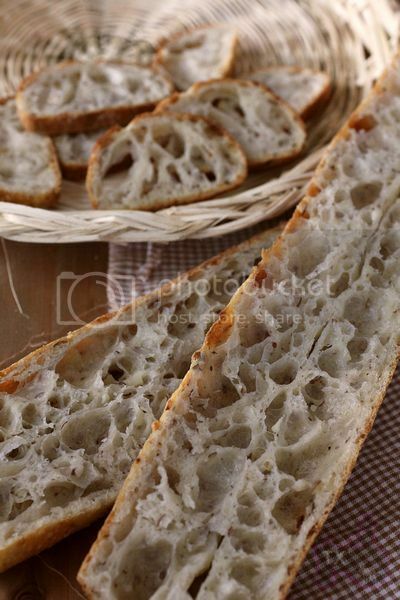 Don't get me wrong, they are all delicious, I just love this 36 hr SD baguette formula and its endless variations. However, some favorites just jump out from time to time. -Mix flour, almond meal, icewater, and autolyse for 12 hours. A lot of cakes and cookies use almond meal to enhance flavor and texture, it does the same thing here. So fragrant! Goes well with both savory and sweet fillings. I plan to try nuts other than almonds too. A big hit. 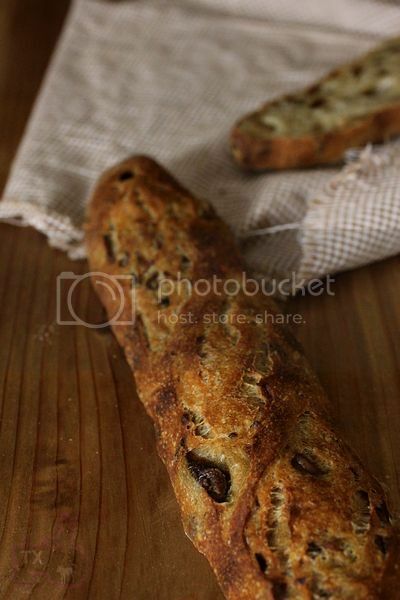 2)With black olives. Lots of them. I planned to only use about 100g of olives, but "accidentally" dumped whatever is left all into the dough, probably more than 150g. That's why olives were practically bursting out of the seams. Tasted great though, a happy "accident". The crazy amount of olives affected the crumb a bit, but not too bad. -Soak mushroom in warm water for 5-10min. Add enough ice water, so that the weight of mushroom+water is 325+50=375g. Mix in flour and autolyse for 12 hours. I love mushroom flavor, so I love this variation, even though wet and sticky mushroom does make the crumb less open, somewhat. They are ABSOLUTELY FABULOUS ! Your baguettes are amazing! The almond one struck me most. You have to boil the almond meal with milk in this recipe. The result was quite good, but the taste of the almond was very discreet. 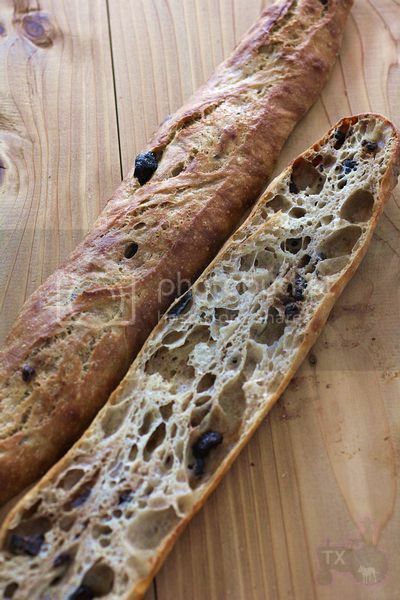 You say your almond baguette was very fragrant, I wonder if it was so, because you used the whole, and not peeled almonds, or because you've just autolysed them. I think the strong fragrance is mainly from the unblanced almonds grounded right before being added to the dough. Boiling and soaking would make the taste milder I think . Thank you, Txfarmer. I'll try your method. 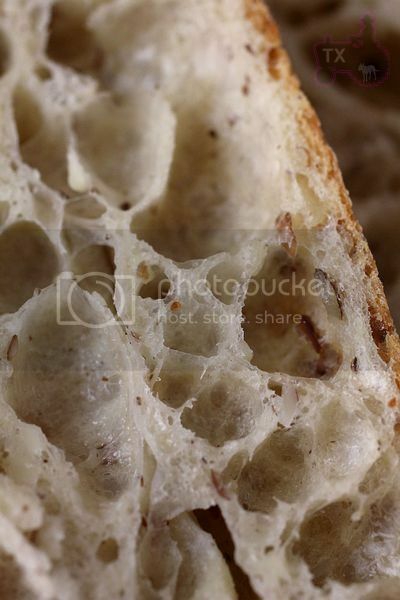 That crumb looks so appetizing. 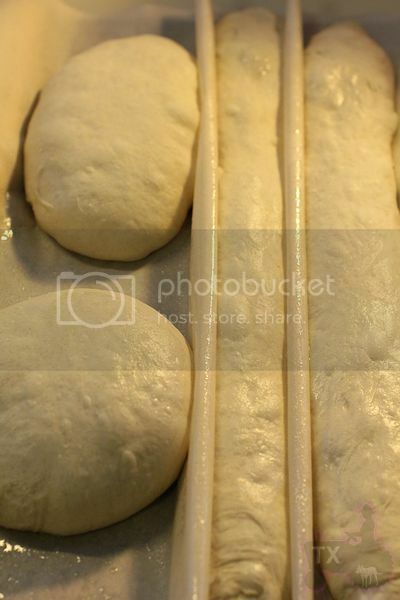 I just wonder how you handle such wet dough for shaping and scoring. 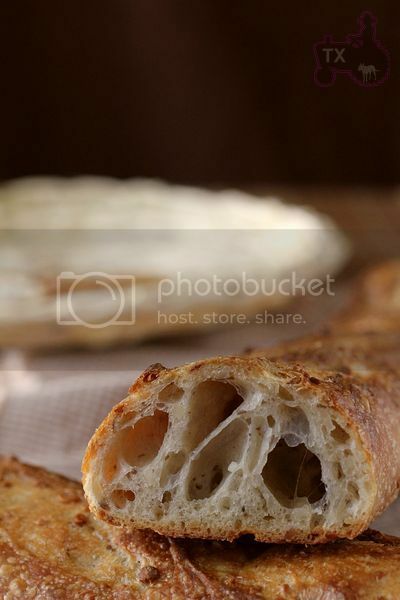 Would it be possible fo you to post some pictures of your dough/ loaves prior or during shaping and than scoring? Here's a picture of the dough from another batch (not one of the 3 variations posted this time), it's probably a less wet dough since I made two of the portions into boules. This picture below is from yet another batch, probably with similar hydration level as the 3 variations posted this time. Honestly they all handle pretty similarly and give similar results. The key is know exactly what needs to be done and do it quickly. Wet dough is sticky, no ways around it. The best way to avoid getting stuck is to touch it less. So figure out the necessary steps to shape it well, and do nothing more. 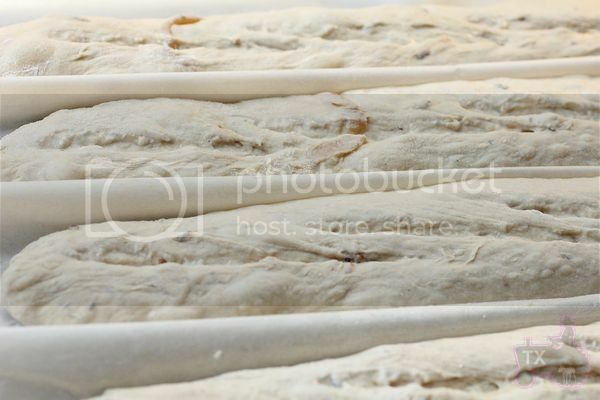 First pic looks like the loaves were already water sprayed correct? 2nd pic below shows how difficult of a slash/score it is , kinda looks like it's not a clear cut, just a "push" into the dough...I NOW know how you get those humongous holes in the crumb :). “Water sprayed"? I never spray water on my dough. 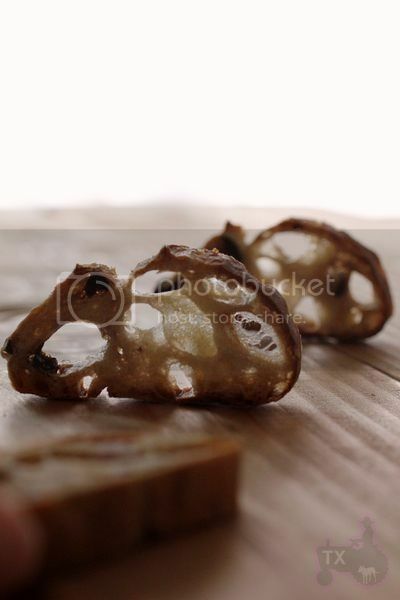 Love the pic of your loaf sliced in half, viewed from the top! Gorgeous crumb, and the add-ins sound delicious. Its the baker not the ingredients, Txfarmer! 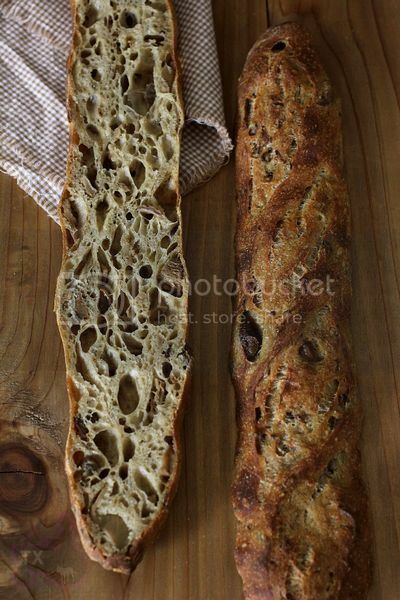 heck, if you're given sawdust with some flour, you'd turn out a perfect baguette anyway. Keep em coming, seattle - farmer! I know I've said this before but I have to say it again......Why aren't you living near me? 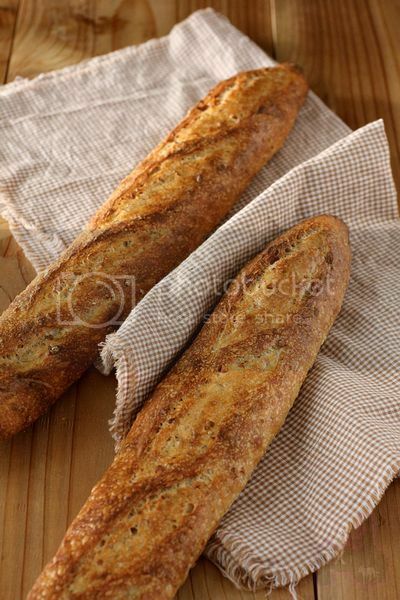 I'd pay good money for buying baguettes like these! p.s. - Haven't been checking the forum very much last few weeks, but hope your moving went OK. If I may ask a silly question. What is your couche made of? 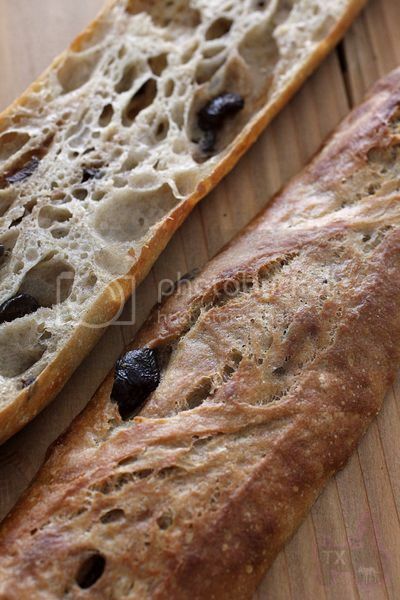 In the one picture with the boules it appears everything is wet and shiny but you don't spray your loaves so what material is the couche made of that it is so shiny as well?